The 36 000ha Lapalala Wilderness is located in Limpopo Province, 50km to the north-north-east of the town of Vaalwater and 100km west of Polokwane. The reserve falls within the mountainous Waterberg region that stretches from BelaBela in the south to Lephalale in the north, and from Thabazimbi in the west to Mokopane in the east. Coordinates: 230 44′ – 230 57′ South; 280 09′ – 280 25′ East. The reserve’s position relative to the Marakele National Park, as well as other provincial and private nature reserves and game farms in the Waterberg Biosphere Reserve, is of great relevance to the effectiveness of the reserve’s conservation efforts. The combined efforts of many of these conservation-focused reserves and farms have the potential to deliver significant environmental sustainability benefits for the region and country, while impacting positively on the preservation of at-risk plant and animal species. The Waterberg falls within the summer rainfall region with a mid-summer (January) seasonality. 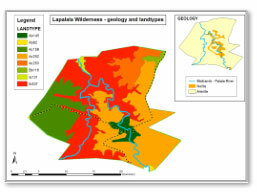 The overall mean annual rainfall for Lapalala is estimated at 500 mm, but ranges from 400 mm in the low-lying area in the north to 600 mm on the higher-lying south-western border. Mean minimum and maximum monthly temperatures are respectively 20°C and 20°C in July and 14°C and 30°C in January. Frost is common during winter months, with an average of 61 to 90 days of frost annually. Lapalala also experiences between 5.1 and 7.5 lightning strikes per year per 100 ha. Lapalala is mostly underlain by acid, ancient sandstones of the Kransberg Subgroup of the Waterberg Group. More recent intrusions of basic norite/epidiorite are found in the central part. Generally, soils resulting from the sandstones are dystrophic, meaning that they are extensively leached and nutrient poor. Soils derived from the basic intrusive substrate are more clayey and nutrient rich. 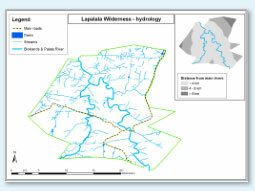 Eight different land types have been identified in the reserve, which is an indication of the heterogeneity, and thus habitat diversity, of Lapalala. This richness of habitats makes the consolidated area of the extensive Lapalala reserve particularly valuable from a conservation point of view, and offers opportunities for research and study through a wide variety of different natural terrain. 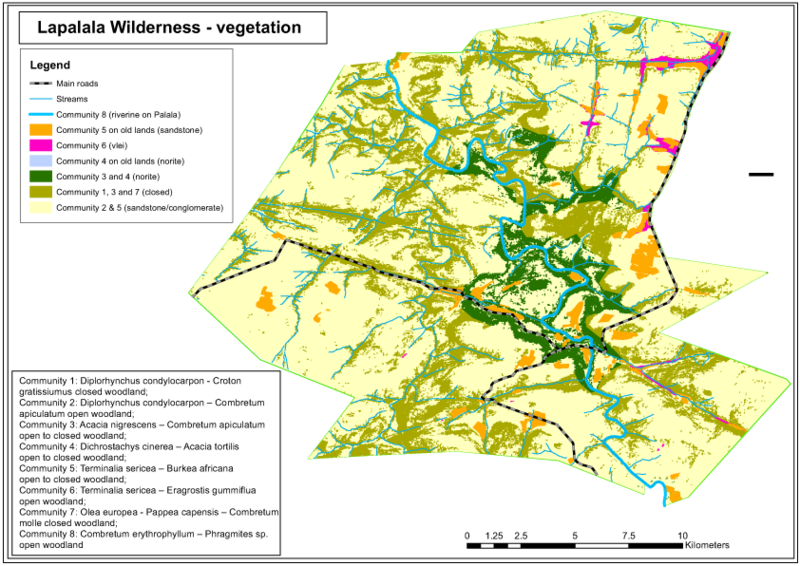 Lapalala is bisected by the perennial Palala river that drains the area from south to north. The most important tributary to the Palala River is the perennial Bloklands Spruit. 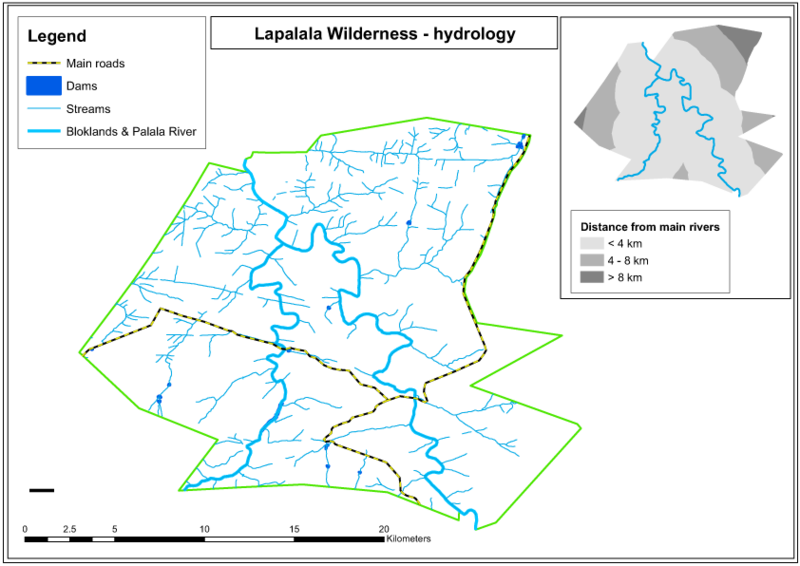 A network of smaller streams drains the area along a conspicuous block-like fracture pattern into the Palala and Bloklands. These lines represent intrusive dykes that have weathered faster than the surrounding sandstone. A number of dams have been built on the Bloklands and on minor streams. Although access to the rivers is sometimes difficult as a result of the steep topography, Lapalala can be considered as being well-watered. 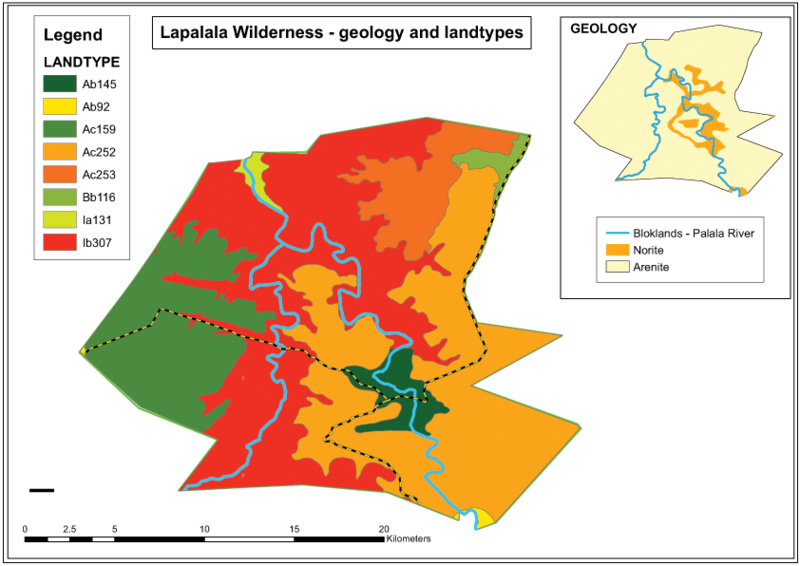 A full 72.8% of the property is within 4 km of the two main rivers, with 23.1% between 4 and 8 km and only 4.0% further than 8 km from water. 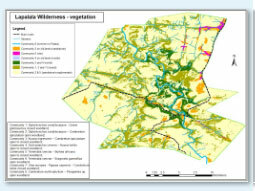 Seeps and wetlands occur extensively. The porous, sedimentary sandstone bands form good aquifers that hold water like giant sponges, slowly releasing it. Water levels fluctuate dramatically, depending on the current season’s as well as previous season’s rainfall.